NASA satellite images offer a dramatic look at how much rain fell this month during some of California's strongest storms in years. NASA used images provided by data from its Global Precipitation Measurement system to show estimated rainfall totals over the western United States from Jan. 17 to 24. Rainfall totals of more than 9 inches, depicted by purplish colors, were detected in some parts of California, where the storms caused flooding and landslides, but also helped ease drought conditions. The map released Wednesday shows a swath of rainfall that stretches from the Pacific Northwest to Southern California and into the Baja Peninsula. Sunday marked the most intense periods of rain in Southern California, where Long Beach was drenched with about 4 inches in one day. The relentess downpours caused rockslides, flooding and road closures throughout the region. California finally got a break Monday from the three-day winter storm that broke rainfall records, washed out roads and churned up tremendous waves. Sunshine and rainbows alternated with thunderclaps, downpours, snow and hail as the last of the storm system broke up. The weekend of rain helped diminish drought conditions. Nearly 50 percent of California is no longer in drought, according to the U.S. Drought Monitor report released Thursday. The report is the first since the latest round of storms. 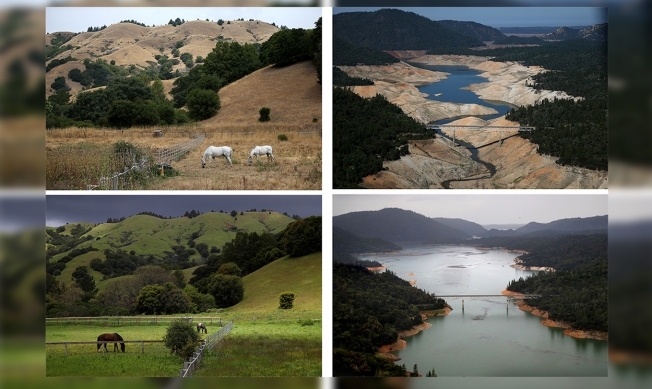 At this time last year, 95 percent of California was in drought. The Global Precipitation Measurement system was launched in February 2014 to provide better precipitation measurements around the world using data provided by a satellite network.